This article is about the film shorts from Poochy & Yoshi's Woolly World. For the location in Mario & Luigi: Superstar Saga, see Yoshi Theater (Mario & Luigi: Superstar Saga). Episode 7 as seen in the game screen. The Yoshi Theater is a series of stop-motion animated short films featured in Poochy & Yoshi's Woolly World. It was produced by the Japanese animation studio, dwarf. This mode is found after choosing a game file at the start menu and in the Scrapbook Theater. The series centers on the daily life of the Yoshis and Poochy outside their adventures. The setting takes place inside a house. There are 31 short films in total, a new video is available each day after watching, based on the Nintendo 3DS internal clock. At the end of each film, a multiple choice question related to the clip appears for the player to answer. If answered correctly, they receive 500 Beads. The music most commonly heard in the background of these shorts is "Yarn Yoshi Takes Shape!" (which is the first level in both Poochy & Yoshi's Woolly World and Yoshi's Woolly World) or the music that plays in the Yoshi Hut. Fetch It! Yoshi holds a ball of yarn. He pats it twice and asks Poochy if he's ready. Poochy nods yes. However, when Yoshi throws it, Poochy doesn't fetch it. Yoshi points to where he threw it to make Poochy fetch the ball, but Poochy does not fetch it. Yoshi grabs another ball. He pats it twice and asks Poochy if he is really ready this time. Poochy nods yes. Yoshi throws it, but Poochy doesn't fetch it. Yoshi tells Poochy to fetch it, but Poochy instead "bites" onto Yoshi's outstretched arm. The screen pans out showing more balls of yarn in a huge pile, and one falls off. Yarn Yoshi Takes Shape! What happened to the yarn balls Yoshi threw? The Best For Last Poochy is looking at a slice of cake. Wanting to eat the strawberry at the top, he begins to eat the cake. After taking seven bites, Yoshi shows up. He uses his tongue to grab the strawberry and eats it, which leads to Poochy getting upset and his tail falls down and walking towards Yoshi. He stops after Yoshi backs off the screen. Yarn Yoshi Takes Shape! What did Poochy do with the strawberry? From "saving the best for last." Penalty Shoot-out Yoshi and Light Blue Yoshi are playing a game of soccer (football). Light Blue Yoshi kicks his left foot, then his right. He then hops twice, ready to catch the yarn ball, and growls. Yoshi kicks the yarn ball. Light Blue Yoshi attempts to catch it, but falls unconscious. Yoshi cheers until Poochy catches the yarn ball and takes it before it can go through the goals. He runs off with it and, while Yoshi tries to catch him, Light Blue Yoshi wakes up then looks around in confusion. Yarn Yoshi Takes Shape! What sport are Yoshi and his friends playing? A penalty shootout is a method of determining a winner in a sports match that would have otherwise been drawn or tied. That Takes the Biscuit Poochy climbs up the table, seeing two cookies. One shaped like a checkered board, and another looking like a flower. Poochy grabs the flower shaped one and tosses it in the air. Before he can eat it though, Light Blue Yoshi with wings floats past and grabs it. Poochy finds out and begs for it back. Yoshi with wings grabs the checkered one and Poochy watches helplessly and whimpers. Yoshi Hut What shape was the biscuit that Light Blue Yoshi left with? From "take the cake," meaning to be the best at something. Chaaarge! Poochy walks a few steps and faces toward the screen, then he runs toward the screen. He hits the screen and falls over onto his back, struggling to get up. A Little Light Snowfall What did Poochy do before running? Pause for Fort Pink Yoshi and Poochy walk across a desk, carrying a pencil together. They are then heard placing the pencil down and run back to the other side of the desk. They carry a stack of three small books back, with Poochy bouncing to re-adjust the books balanced on his head and Pink Yoshi cries out in surprise. They are then seen carrying some small rolls of tape in that same direction, with Pink Yoshi becoming concerned when Poochy's large stack of tape balanced upon his head begins to over-balance. Pink Yoshi is then seen trying to push a pencil sharpener in that very same direction but she is struggling, and she seems surprised when Poochy can push it easily with his head. Pink Yoshi then balances upon Poochy, and precariously places a roll of tape on the very top of a stack of other rolls of tape. Pink Yoshi and Poochy are then seen sitting down, side-by-side. The camera pans out to reveal that they have built a fort out of pencils, rolls of tape, small books, the sharpener, and erasers. They are very happy with their work. Pink Yoshi holds up her hand, possibly for a high-five. Poochy looks at her for a moment, before licking her hand, surprising her. Yarn Yoshi Takes Shape! What did Pink Yoshi and Poochy carry first? A pun on "pause for thought." Pancake Palaver Light Blue Yoshi and Pink Yoshi happen across a stack of pancakes on a plate, Light Blue Yoshi looks back at Pink Yoshi and goes 'mmm'. He picks up a fork, but has trouble maintaining the balance of the heavy utensil. Pink Yoshi helps him, but Light Blue Yoshi falls over backwards, squashing Pink Yoshi with the fork by mistake. Unaware of Pink Yoshi's predicament, Light Blue Yoshi then tries to lift up the fork again, but catches sight of Pink Yoshi unconscious behind him and, in doing so, overbalances and knocks himself out in the process. Sunset at Curtain Falls Which Yoshi had the fork? A 'palaver' is a prolonged and tedious fuss or discussion. What Goes Up...? Poochy is on a see-saw made up of a ruler on a thread-spool. Yoshi then nods and jumps on the lever, sending Poochy into the air. When Poochy comes down, eyes shut, he launches Yoshi into the air, who disappears off-screen. When he opens his eyes, he looks up and he whimpers. After looking for a bit, he looks at the viewer(s) and wags his tail. Bounceabout Woods When Poochy landed, what was the look on his face? From "what goes up must come down." Lights Out! It's nighttime. Yoshi yawns and pats Poochy as he picks a button. Yoshi walk towards a basket of yarn balls with Poochy behind him. He pats him again and Yoshi uses him as a stool. Yoshi pats Poochy yet again, then throws the button as a frisbee. Poochy catches it, and turns off the lamp in the process. Yoshi then falls asleep, while Poochy wags his tail. Where did Yoshi sleep? What was Yoshi's reaction when the lights went out? Lost in Limbo The Yoshis and Poochy have set up a small limbo game, with Yoshi and Pink Yoshi standing on two two small rolls of tape and two small erasers, respectively. They hold a yellow pencil as the limbo stick. Poochy easily clears the limbo, and Light Blue Yoshi wants to go next. The other two Yoshis agree and hold up the stick. Light Blue Yoshi closes his eyes and attempts to limbo, but his nose cannot go under the pencil even though the other two Yoshis tried to raise it higher for him. He is unaware of this and continues to walk forwards, despite the other two Yoshis calling out to him as he pushes them off-screen. Poochy tries to grab onto Yoshi, but is also pushed off-screen. What part of Yoshi got caught on the pole? The Goal Ring Poochy sits with a strawberry-glazed donut held upright in his mouth. Yoshi comes onto the screen, and then gets ready to run and jump through the 'goal ring'. He does just this, but does not make it all of the way through, and Poochy continues to hold the donut up as Yoshi is stuck in it. Yoshi sweat-drops. Bounceabout Woods What did Poochy have in his mouth? The Goal Ring found at the end of the level in Poochy & Yoshi's Woolly World. Piano Prancer Pink Yoshi stands atop a yellow toy piano and bows. She then begins to hop around on the piano, playing "Yarn Yoshi Takes Shape!" with her feet, struggling a bit with the harder parts, but having fun nonetheless. Her song is ruined, however, when Poochy runs across the piano during a particularly tricky part, knocking her over in the process. Yarn Yoshi Takes Shape! (played by Pink Yoshi on the toy piano) What color was the piano? Racing Rivals The Yoshis have set up a race track of string making up two lanes, and Yoshi and Light Blue Yoshi get ready to race. Pink Yoshi presses on a stapler that makes a sound like a starting gun, and then she and Poochy cheer as the other two Yoshis begin their race. Yoshi pulls ahead but then trips, and Light Blue Yoshi cheers as he now has a big lead. However, Yoshi then goes galloping past on Poochy, easily winning the race and leaving a puffed out Light Blue Yoshi to finish in last. Yoshi Transformed Who was winning at first? Sleeping Dogs Who was taking a nap? From the old phrase "let sleeping dogs lie." Ping! Yoshi is playing with an elastic band, stretching it out on either side, until Poochy shows up. Poochy pulls the elastic band, Yoshi tries to hold on, but he eventually loses his grip, and gasps as Poochy goes flying. Yoshi closes his eyes and then slowly opens them, gasping again, because Poochy has crashed into an unknown object (possibly a wall). Vs. Big Montgomery The sound that an elastic band makes when it's shot from one's thumb after being pulled back. The Light Show Poochy sits upon a desk lamp, and uses his tail to click off the light, before clicking it back on a again to reveal Yoshi. Yoshi is holding a pencil, which he twirls across his back expertly, before Poochy clicks the light off again and then back on. Light Blue Yoshi is standing on a ball of red twine, which he balances on, almost losing his balance but managing to stay up there. Poochy once again clicks the light off and on again, to reveal Pink Yoshi with wings. She hovers briefly into the air before Poochy clicks the light off and then back on. Mega Yarn Yoshi is standing there, which scares Poochy, and he quickly clicks the light off and then on again. Normal Yoshi is back, this time wearing a Yoshi face cookie like a mask, which he steps out from behind and then poses. Poochy clicks the light off again and then back on, and the book 'My Cat Is A Great Chef' is seen standing upright and open. It then falls over to reveal that Light Blue Yoshi is sleeping behind it. Poochy once again clicks the light off and then back on, to reveal an empty coffee mug from which Pink Yoshi appears from within and waves cheerfully. Poochy clicks the light off and then on once more, but nobody is there. Poochy looks around, and then clicks the light off once more. Across the Fluttering Dunes A light show is a spectacle of colored lights that sometimes move, such as at a concert or a disco. Making a Mark Light Blue Yoshi is holding a black marker, and draws carefully, before getting right into it and drawing wildly and boldly. It is then revealed that he was drawing on Poochy's face to make it funny. Light Blue Yoshi tries to hold in his laughter, but fails, and ends up laughing in earnest as Poochy wags his tail. Yoshi Hut For someone to "make a mark" is to do something that makes them famous. Snooze Glutton Yoshi is sleeping on a desk under a small brown knitted blanket. A normal-sized red alarm clock on the desk begins to ring and, no matter how much Yoshi tries to ignore it and continue with his sleeping, it just continues to ring even louder and more annoyingly. Finally, Yoshi has had enough and jumps out from underneath the blanket, flicking out his long tongue and eating the alarm clock. It doesn't work, however, as the clock just continues to ring inside of Yoshi (now sporting a very big, vaguely alarm clock shaped belly). From "snooze button." Bear Scare Yoshi is walking across a desk at night, when a plush teddy bear in the background falls over after he walks past it. Yoshi gasps and turns around, but sighs, seeing as it was only the bear. He then takes a few more steps forwards, and the bear slides along the desk towards him. He gasps and looks back as the bear stops, before taking a few more steps and turning around, to see that the bear is now moving towards him. He runs off of the screen and the bear gives 'chase'. Yoshi runs back on-screen and slows down, looking behind him, but then panics as the bear follows him. He tries to run, but the bear pounces on him, pinning him to the desk. Yoshi struggles for a few moments before giving up, exhausted. Poochy then emerges from beneath the bear as well, revealing himself to be the culprit. Spooky Scraps! Don't Get Spooked! Coffee Break Yoshi and Poochy find a mug of coffee, and Yoshi happily sniffs at the air (saying "wow") before hugging the coffee mug, as Poochy circles around it. Poochy then gets beneath Yoshi and boosts him up, but Yoshi loses his balance and topples into the coffee. He emerges colored-in brown but otherwise fine - his new coloration possibly startles Poochy, however, and Yoshi can only watch as Poochy runs off of the screen. Yoshi Hut Coffee break (literally a break taken, usually at work, for coffee). Game Over Pink Yoshi and Poochy are playing on a Nintendo 3DS, the screen of which is facing away from the viewer/s. They exchange a look that they are both ready, and then begin the level, with Pink Yoshi controlling the movement buttons and Poochy in charge of the jump button. They are winning and clearly enjoying the game, until the sounds change to the lose a life and then the game over scenarios. Pink Yoshi feels utterly defeated and falls down, and Poochy's tail stops wagging and droops. The sounds from the 3DS clearly shows that the game that is being played is a Super Mario Bros. game, complete with the Super Star theme that makes both Pink Yoshi and Poochy cheer, and the losing a life and game over sounds. Flutterly Bored A pun on "utterly bored." Toing and Froing Poochy runs to the left, then runs to the right with a fork in his mouth. Poochy then runs to the left with a cookie shaped like Yoshi's head. Poochy then runs to the right with an apple on his back, with a winged Pink Yoshi following him, trying to get the apple. Poochy then tries to push a melon to the left. Poochy then gives Yoshi a piggy back ride to the right. Yoshi then struggles to gives Poochy a piggy back ride to the left. Poochy then rolls over and over to the right. Yoshi and Cookies "Toing and froing," or "moving to and fro," is to move back and forth. 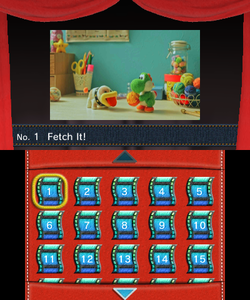 An Open-and-shut Case Yoshi and Poochy are looking at a closed white Nintendo 3DS on a desk. Yoshi then tries to open the 3DS but, without anything holding down the lower half, he cannot get the screen opened. He then looks at Poochy, and then looks a little bit surprised at Poochy bounds over to the other side of the 3DS, and tries to help him open it (he uses his mouth). Both of them struggle, but, together, they manage to open up the 3DS. "Yarn Yoshi Takes Shape! ", the first level from Poochy & Yoshi's Woolly World, is shown on the screen as Poochy wags his tail happily. It is short-lived, however, as the 3DS then falls over backwards, before closing itself once again. Poochy's tail stops wagging and then droops, and he and Yoshi can only look at each other. Yarn Yoshi Takes Shape! An open-and-shut case in law is a legal case or matter that is easy to prove because the facts are very clear. This page was last edited on April 24, 2019, at 09:29.